Tranquility trails the long, tree-shaded driveway, reminiscent of an old Southern plantation even though it’s in the Southwest. By the time I reach the house, the city atmosphere has dropped out of my consciousness. Serenity settles around as softly as evening shadows. Larry and I have arrived at Los Poblanos Inn, just a magical moment away from the sounds of Albuquerque, New Mexico, but a world away in attitude. A courtyard bursting with red, pink, and white blooms, water cascading from the blue and yellow star-shaped fountain, peacocks strutting and cawing--all transport us to a different time and place. That’s precisely the point because the history of Los Poblanos is inextricably intertwined with the history of Albuquerque on many levels--politics, culture, architecture, and agriculture. Built more than 70 years ago by Albert and Ruth Simms—both U. S. Congressional representatives and members of the Washington elite—the present-day inn was originally designed as their home and a place to accommodate guests. 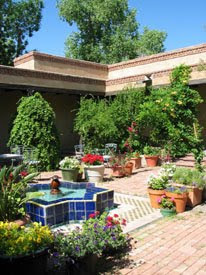 The couple hired John Gaw Meem, widely recognized as the “father of Santa Fe style” of architecture, to remodel the existing farmhouse and to create La Quinta Cultural Center, hub of the city’s political and cultural activities for many years--a work of art itself as well as a gallery for showcasing art forms. Settled centuries ago, the river valley looking toward the Sandia Mountains became farmland during the 19th century. After the Simmses purchased the land in the 1930’s, they reassembled the ranch and began activities that assured its historical importance. Ruth brought her herd of Holstein dairy cattle from Illinois and launched Creamland Diaries, still in operation today. Various crops were farmed, and today Los Poblanos operates two community-supported organic farms growing fruits, vegetables, and herbs. 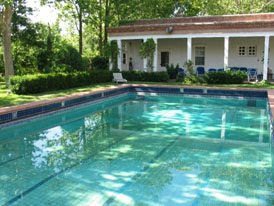 The Simmses established the Albuquerque Little Theater and other arts organizations and built Albuquerque’s first swimming pool. Academic institutions they started remain vibrant forces in the community. “This place is good at helping people peel back the layers of Albuquerque,” says Matthew Rembe, executive director and son of Penny and Armin Rembe, who purchased the property in 1976. Rembe led us on a tour of the property, explaining that Los Poblanos was home to the Rembe family and a working farm before they decided in 1997 to return the land to its original intent. That meant keeping the property together with gardens and an environmentally responsible agricultural program plus providing an avenue for continued art and architecture study. A fellowship program at the University of New Mexico now allows graduate students to base their doctoral theses on different aspects of the property. Check back for more about this incredible place. Thank you for the nice write up! We're glad you enjoyed your visit - hope to see you again soon!